It’s not a “full-on” gut job renovation like most kitchen makeovers are. I actually really like a lot of things about the kitchen, so my plan is to improve upon the things I don’t like, while keeping the things I do. This makes a big impact for a small(ish) amount of money and time. I began with a list, jotting down all of the things I like/dislike about my kitchen, and then began drawing a little more detailed plans of each stage. The floor: it’s just a simple linoleum, but you’d be surprised how many people think it’s real tile. Plus, it was put in really recently (before I purchased). The cabinets: while I’m not 100% crazy about the color of the cabinets, I like the plain style of them, and they are well-made. I added new hardware when I moved in, and I really like the look of them. The range-area: Everything is so seamless throughout the kitchen, except for the range area. 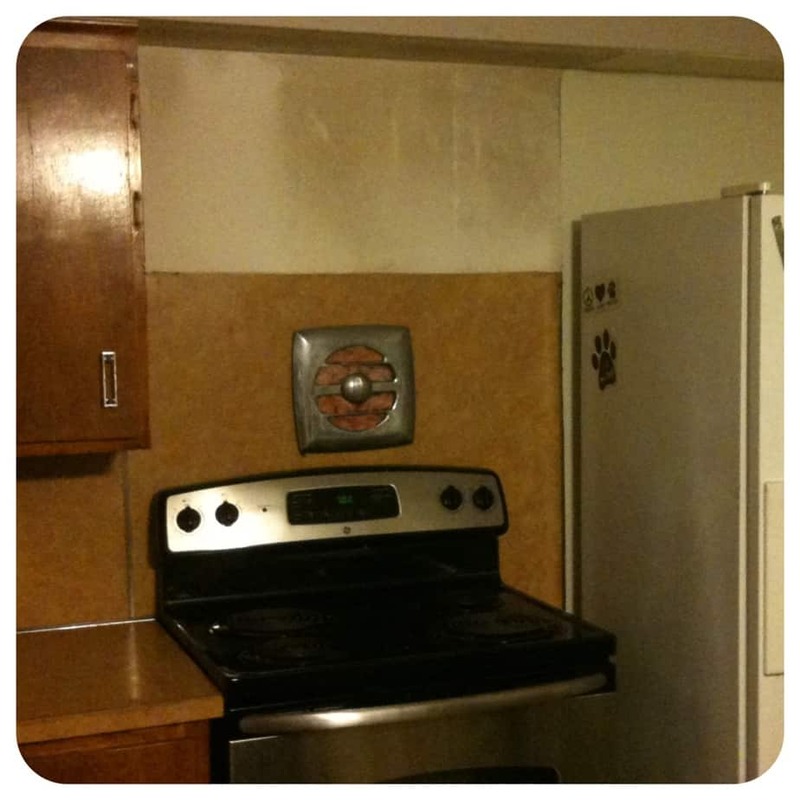 The stove is 30″, but the cabinet above is 40″. Because of this, there’s a 10″ gap to the right of the range. It also makes it very difficult to add a microwave or range hood, because the range is not centered under this cabinet, and the hoods and microwaves come standard as 30″, not 40″. The range vent is broken: I shoved insulation into the hole, but the vent does not work, nor is it energy efficient to have a vent like this. The fridge is pushed against the wall surrounded by a cabinet, and I can’t open the fridge side of the door all the way because it hits the wall. The sink: it’s white, and old, and dinged up. I can’t get get it clean for the life of me, and it drives me nuts. 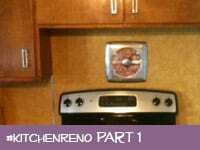 The countertops/backsplash: They are both yellow laminate. That old, 70’s laminate… it makes the whole kitchen look so dated. Might be hard to grasp this drawing, but basically it’s the complete remedy to bullet points 1, 2, AND 3 of my “Don’t Love” list. Killing 3 birds with one stone? I WILL TAKE IT!! The photo to the right shows a closeup of the problem explained above. Can you see how the cabinet above the range is a lot wider than the actual range? See the gap to the right of the range? The ugly range vent filled with insulation? See the cabinet above wedging the refrigerator into the corner? The drawing above solves these problems. Removing the upper cabinets was the first step to fixing this problem area. With the cabinets removed, we were able to get more accurate measurements and really see what needed to be done next. After cutting everything out, we realized that the upper cabinet above the countertop did not quite line up with the base cabinets under the countertop. Luckily, we were able to use pieces that we just removed and create a 1.5″ filler next to the upper cabinet. Now, the uppers and lowers line up perfectly with each other. The vent was the next project to tackle. Basically, the old vent had to be removed, and sealed up. We took the vent down, sealed the hole using wood and sheetrock. The wiring that was connected to the vent wasn’t actually the problem (the vent was broken) which came in really handy for making a new outlet within the cabinet. We ran the wire up, and installed an outlet that would allow the microwave to be plugged in without having the wire showing. The solution to the 40″ cabinet was simple: buy a standard 30″ cabinet. That way, it will be centered directly above the range. I opted for a 30″ x 12″ cabinet (as opposed to the 40″ x 16″ cabinet that we removed). This shorter cabinet gave me more vertical space — actually enough space to install an above-the-range microwave with a vent!! How cool!! I’ve always wanted one, but never thought it was possible. So, coupons-in-hand, I went to the local big box and got a stock unfinished cabinet for about $50, and the microwave that matched my new range for about $250. a hole had to be cut in the back of the cabinet to account for the new outlet just installed. it’s difficult to hold something heavy over your head for a long period of time. the studs actually landed in really awkward places within the cabinet, making it difficult to use the power drill. getting everything flush and level took some work – we had to shim the back, and take the cabinet down 3 or 4 times before we got it exactly right. Some would think we are perfectionists, but taking pride in your work and doing it over and over until it’s done right is the KEY to a professional-looking project. I know it looks far from done, but the fact that the microwave is HANGING above the range, no one got crushed or electrocuted, and my dad and I are still on speaking terms makes this an incredibly successful DIY weekend. Cut the countertop overhang next to the range so it can slide to the left about 1.5″. 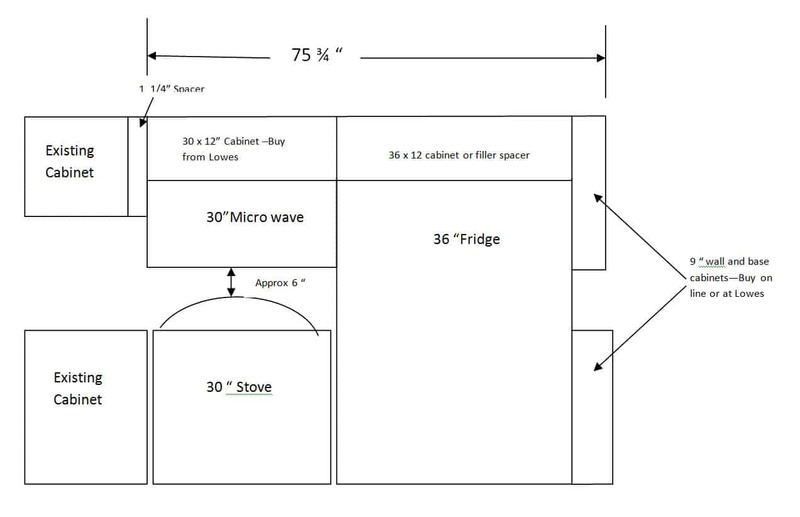 Slide the refrigerator to the left against the range and new microwave. 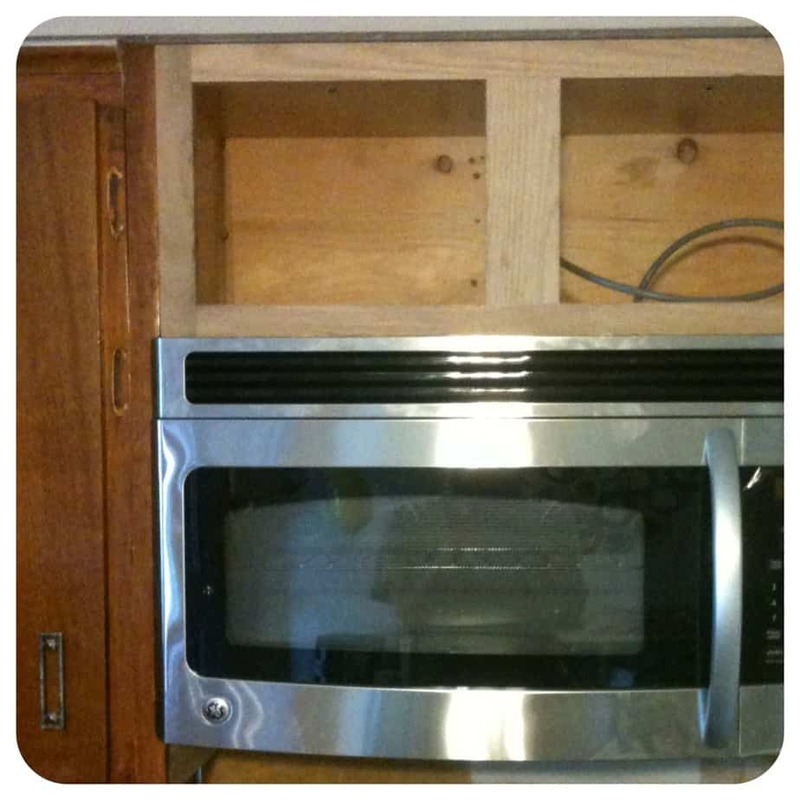 Install a 36″ x 12″ stock cabinet above the refrigerator (this won’t need to be reinforced like the one above the range). Install 9″ wall and base cabinets to the right of the refrigerator. Since this isn’t a standard size, I’m working on having a carpenter make these for me custom. Lots more to come on this renovation. I’ll keep you updated as it happens. I’m also working on the copper penny floor. It will take me some time to get all of the tiles made, but once they are I’ll be posting about the installation process!